The amount of regulator LuxR (BBa_C0062) in the system was shown to influence the pLux promoter's response to the inducer concentration (3OC6-HSL). 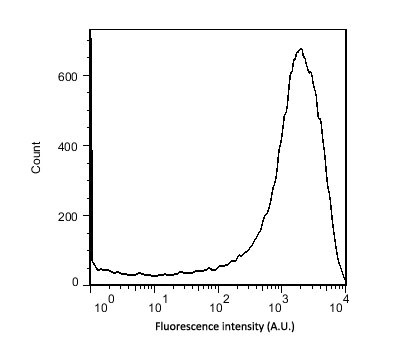 By using the three different constitutive promoters BBa_J23100, BBa_J23109, and BBa_J23111 for the production of LuxR we have measured this effect in terms of fluorescence/OD600 (see Figure 1). The above described E. coli TOP10 strains were grown overnight in Lysogeny Broth (LB) containing kanamycin (50 μg/mL) and ampicillin (200 μg/mL) to an OD600 of about 1.5 (37 °C, 220 rpm). 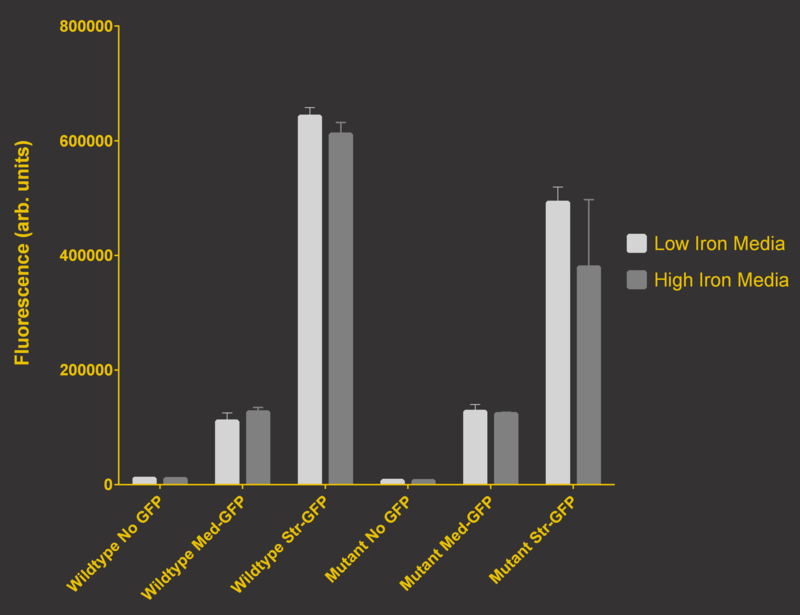 As a reference, a preculture of the same strain lacking the sfGFP gene was included for each assay. The cultures were then diluted 1:40 in fresh LB containing the appropriate antibiotics and measured in triplicates in microtiter plate format on 96-well plates (200 μL culture volume) for 10 h at 37 °C with a Tecan infinite M200 PRO plate reader (optical density measured at 600 nm; fluorescence with an excitation wavelength of 488 nm and an emission wavelength of 530 nm). After 200 min we added the following concentrations of inducers (3OC6-HSL, 3OC12-HSL, and C4-HSL): 10-4 nM and 104 nM (from 100 mM stocks in DMSO). Attention: All the dilutions of 3OC12-HSL should be made in DMSO to avoid precipitation. In addition, in one triplicate only H2O was added as a control. From the the obtained kinetic data, we calculated mean values and plotted the dose-response-curve for 200 min past induction (see Figure 1). 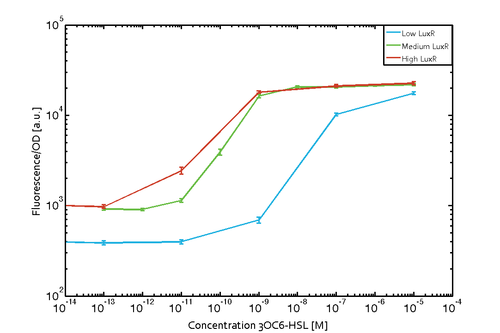 The measurements of the induced system with 3OC6-HSL concentrations of 10-13 M to 10-5 M showed an increasing sensitivity of the pLux (BBa_R0062) promoter (in terms of fluorescence per OD600) for increasing strength of the promoter controlling LuxR (BBa_C0062) expression (see Figure 1). For BBa_J23100 (strongest promoter chosen) the sensitivity is highest (half maximal effective concentration EC50 approximately 20 pM), for BBa_J23109 (weakest one chosen) the sensitivity is lowest (EC50 approximately 100 pM), with BBa_J23111 (medium) falling between these two but closer to the strong promoter (EC50 approximately 10 nM). Overall, this is in line with the promoter strength given in the Anderson collection. 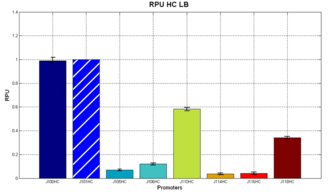 Figure 1 Influence of varied promoter strength on the expression of LuxR (BBa_C0062) and the resulting effect on pLux (BBa_R0062). 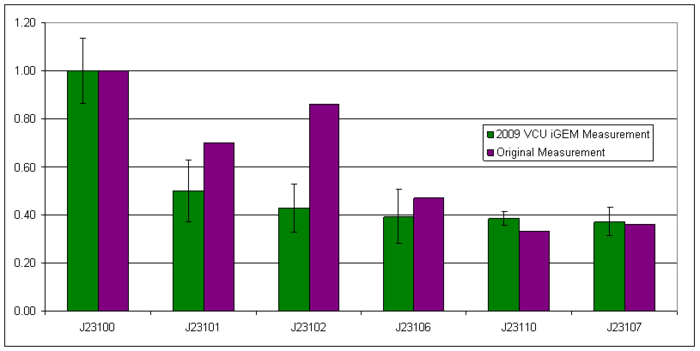 The fluorescence per OD600 is shown over an inducer-range of 10-13 M to 10-5 M. The promoters used are: BBa_J23100 (high LuxR expression, red), BBa_J23111 (medium LuxR expression, green), and BBa_J23109 (low LuxR expression, blue). All three promoters are part of the Anderson collection. Data points are mean values of triplicate measurements in 96-well microtiter plates 200 min after induction ± standard deviation. For the full data set and kinetics please contact us or visit the raw data page. We fused the constitutive promoters to a sfGFP reporter to test their stochastic dynamics by means of measuring fluorescence intensity of sfGFP using flow cytometry. In the meantime, we inserted the 16nt Csy4 insulator between the promoter and the reporter to stardardize the expression of the reporter downstream by eliminating the influence from 5'UTR. 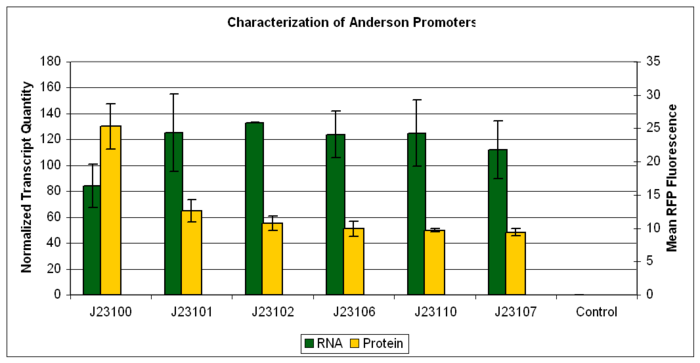 The following chart shows the distribution of sfGFP expression in the circumstance of promoter J23100. Figure 1. 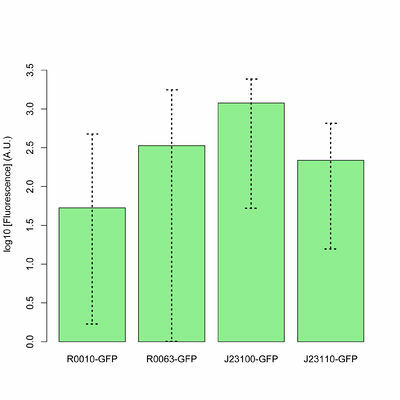 The distribution of the sfGFP expression tested by flow cytometry with promoter J23100. Figure 2. The intensity of different promoters is shown by the column height and the randomness of their functions by the bar width. To test the expression of sensory rhodopsin triggered by constitutive promoter BBa_J23100 to sense light, we need to test the effect conferred by different E. coli strains to expression of red fluorescence protein reporter downstream of BBa_J23100 to different bacterial strains. It allows us to select the suitable strain(s) for this constitutive promoter for expressing sensory rhodopsin. Florescence plate reader was used to take readings of fluorescence emission of 635nm and absorbance at 600nm (OD600) between time intervals of 12 hours on each strain. The measurements were started when the cultures reached a OD600 of around 0.4 that represents log phase of active proliferation. Growth curve and fluorescence intensity against time were plotted to compare cell growth and protein expression on different strains. Three independent experiments were conducted. 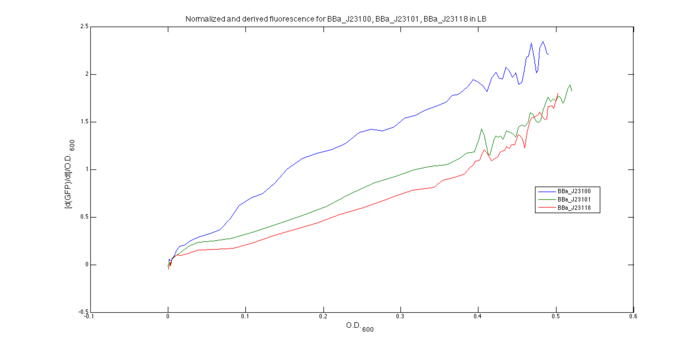 No significant difference was observed on the growth curves, indicating a similar growth rate among the three bacterial strains with BBa_J23100 transformed. It implies the promoter does not cause cell toxicity or growth inhibition of these three bacterial strains. 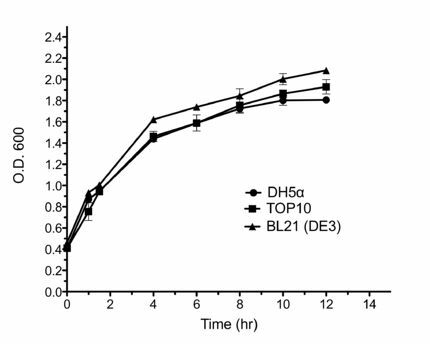 For the protein expression, the results showed that the fluorescence intensity of reporter in DH5α was significantly lower compared with TOP10 and BL21(DE3). 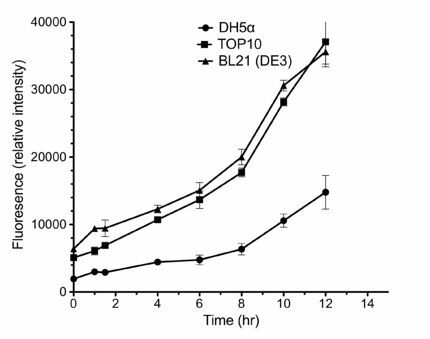 To conclude, DH5α is not an optimal strain to utilize promoter BBa_J23100, while TOP10 and BL 21(DE3) can effectively express the reporter. Therefore, in downstream application of our light sensing biobricks (BBa_K786001, BBa_K786002, BBa_K786003) in which BBa_J23100 was used, DH5α are not used. This Anderson promoter was evaluated without fused RFP with the lux operon as a reporter in B. subtilis. See the new BioBrick BBa_K823004 without RFP and have a look at the Data from the evaluation in B. subtilis. We mutated the Tar chemoreceptor at in total 5 amino acid sites under the control of constitutive promoter J23100 which are important for ligand binding. The mutated sites are the nucleotides for the amino acids at position 69, 73, 149, 150 and 154 of Tar. Here we used a the constitutive promoter J23100 from the 2006 Berkeley group to test the chemotaxis of E. coli. Antibiotics were: Ampicillin (Amp) 100 ug/ml. It was stored at -20°C in 1000x stocks. Amp was dissolved in water. The 2009 Virginia Commonwealth University iGEM team characterized select promoters from the Anderson library by measuring fluorescence of a downstream RBS and RFP coding sequence using flow cytometry. These results are a preliminary indication that the performance of these parts may be dependent on cell strain and/or downstream parts. Additional measurements need to be made to verify the reproducibility of these results. 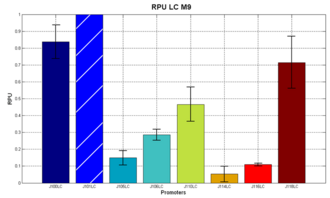 mRNA levels were also measured using quantitative rtPCR, shown below. Surprisingly, RNA levels were found to be inversely related to RFP fluorescence. As mentioned before, both datasets were collected by methods which produce data at different points after the gene expression. 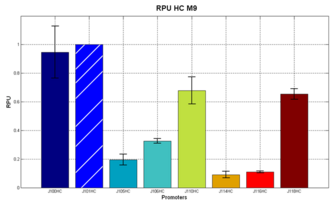 Quantitative real time PCR measures the amount of expressed mRNA while relative fluorescence measurements quantify on protein level. In perspective of stability and half-life periods of mRNA and proteins or due to protein modification, it is comprehensive to obtain varying data-sets and expression rates. Another problem that occurred during our quantitative real-time measurements was the deviation in some of biological replicates. This problem was also observed in another group’s experiments (Kelly et al., 2009). They mentioned variations across experimental conditions in the absolute activity of the BioBricks. To reduce variation in promoter activity, they measured the activity of promoters relative to BBa_J23101. 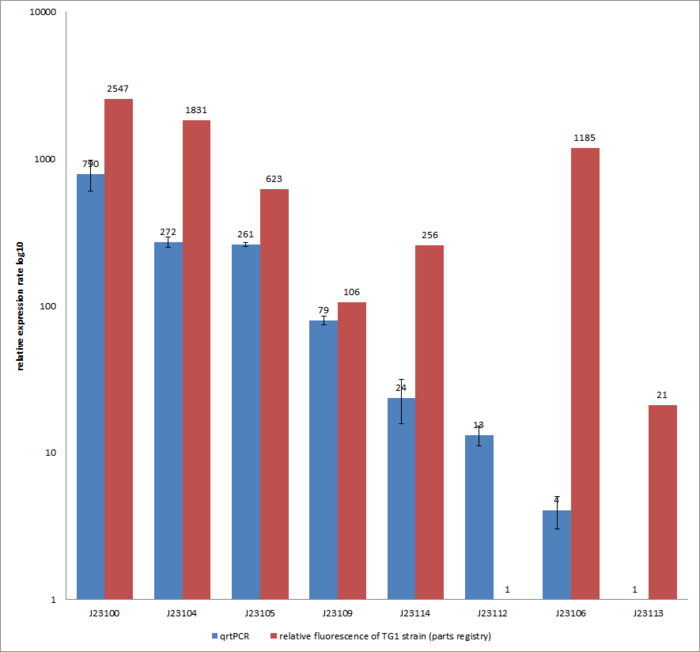 Furthermore, the iGEM team of Groningen which participated in 2009 also measured the relative fluorescence of TG1 strain with the promoters J23100, J23109 and J23106 via Relative Promoter Units (RPUs). Their values indicated the comparable tendency to our documented values. This constitutive promoter works very well. However, using it for molcular cloning is difficult. The level of expression acheived by J23100 caused our cells to grow slowly. After transformations we picked smaller colonies to get the best screens, and liquid cultures took an extra 4-6 hours to reach a decent plasmid prep OD. For future users, we recommend using it only at the end of your molecular cloning process to avoid the problems that arise from additional cellular stresses. We used a constitutive promoter as a component part of our experimental plasmid. However, we used the constitutive promoter as a positive control by placing it upstream of GFP. We present our experience here. In order to ensure that this constitutive promoter works and does not itself exhibit a confounding glucose-concentration dependence, we designed a simple positive-control plasmid consisting of a constitutive promoter upstream of GFP in the promoterless pColi backbone. We resuspended bacteria with each plasmid in 10 mL of LB broth overnight. 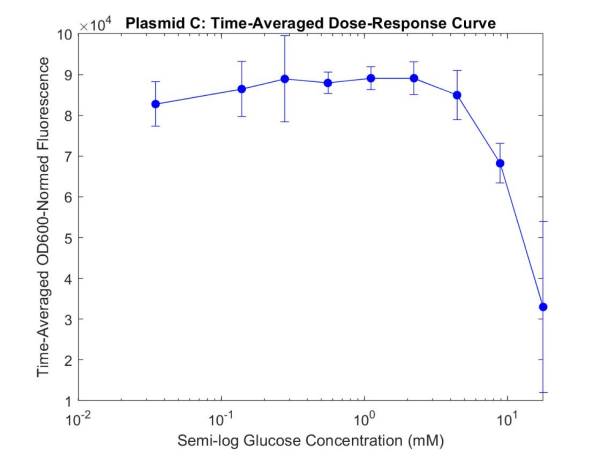 For the plasmid, we measured fluorescence over glucose concentrations ranging from 17.78 mM to 0.03 mM using two-fold dilutions and 0 mM to characterize a dynamic range. It exhibits a relatively constant fluorescence level across glucose concentrations, which is consistent with expected constitutive expression. "Time-averaged dose-response curves from initial time point to three hours with sampling every 15 minutes. Glucose concentrations ranged from 0.035 mM to 17.78 mM with each concentration doubling the previous. Normed fluorescence levels at a glucose concentration of 0 mM (not shown on semi-log plot) fell below the error bars of the fluorescence level for 0.035 mM for Plasmid E. Mean ± standard error shown for each point."